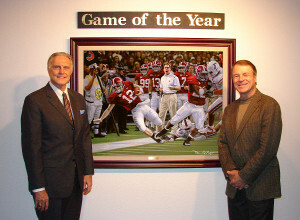 Daniel Moore (right), the 2005 American Sport Artist and Archives (ASAMA) Sport Artist of the Year, displays is 2009 College Football Game of the Year photo with Dr. Gaylon McCullough, a center the Alabama Crimson Tide in the early 60s and teammate of Hall of Fame quarterback Joe Namath. Moore has donated paintings of the Alabama-Auburn "Iron Bowl" games from 1948-’88 when the game was played in Birmingham. Football fans can celebrate the upcoming 2010 Iron Bowl and/or just find an ideal Christmas gift for fan in their family by purchasing a framed painting of a classic Iron Bowl game for only $100.